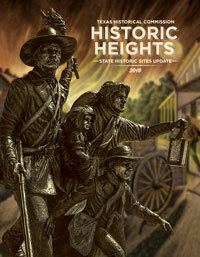 The Texas Historical Commission preserves and operates 22 state historic sites across Texas. We have recently welcomed French Legation in Austin, Texas. These unique places honor Texas history and inspire an understanding of what it means to be a Texan. From American Indian sites to frontier forts to common and elegant homes and the leaders and statesmen who lived in them, these sites enrich people’s lives through history. Please visit and enjoy them! Towering over Acton Cemetery, a statue of Elizabeth Crockett marks the burial site of folk hero Davy Crockett's second wife, who died in 1860. More than 1,200 years ago, a group of Caddo Hasinai Indians built a village and ceremonial center here. Today, three earthen mounds still rise from the lush Piney Woods landscape. Explore the life of one of early Texas’ most influential leaders, José Antonio Navarro, through interactive exhibits in his restored 19th-century home. On the banks of the Navasota River, Civil War veterans met for reunions from 1889–1946. The site remains a gathering place for history events, recreation, and family reunions. The modest white frame house at this site is where the 34th U.S. president and WWII commander, Dwight David “Ike” Eisenhower, was born in 1890. This site memorializes the brave soldiers who fought and lost the Battle of Coleto Creek here in 1836 during the Texas War for Independence. Serving as one in a line of western defensive forts from 1867 to 1881, remnants of Fort Griffin remain today. The site is also home to the Official State of Texas Longhorn Herd. This site preserves the remnants of one of four U.S. Army posts established in 1855 to protect the overland route between San Antonio and El Paso. This 150-year-old West Texas fort stands atop a remote hill in Menard County. It is one of the best-preserved examples of a Texas Indian Wars (1850–75) military post. The French Legation began in 1841 as a private home for French chargé d’affaires to the Republic of Texas. Rising above the Aransas Bay and surrounded by stately live oaks, Fulton Mansion State Historic Site is located in the resort area of Rockport-Fulton. Established in 1849 as a roadside tavern, store, hotel, residences, and mill, Landmark Inn tells the story of migration, industry, and commerce in Texas. Significant to the antebellum period of Texas and the tumultuous era of Reconstruction, this site hosted a sizable plantation operation and two-story Greek Revival-style house. This 1875 adobe home explores the stories of a multicultural family who influenced the early development of the Southwest borderlands. This Spanish mission tells the important history about the Native American experience with Texas’ earliest European settlers. The only institution in the continental U.S. dedicated to telling the story of the Pacific Theater in World War II. The six-acre campus includes exhibits and memorial areas. A significant Civil War battlefield, this site honors the Confederate soldiers that defeated four Union gunboats and prevented forces from penetrating the Texas interior in 1863. Built during the height of Reconstruction, this 1868 home tells the story of the Maxey family as they lived in a changing nation from Reconstruction Era Texas through the First World War. One of the most influential politicians in the 20th century, Sam Rayburn's 1916 home is preserved with original furnishings and memorabilia. This site preserves the location where Stephen F. Austin established his colony in 1823, the first Anglo-American settlement and provisional capital of Texas. This site is composed of several elegant structures as well as period furnishings, clothing, and antiques that map the 150-year history of the Starr family in Texas. This site tells the story of its three owners: Austin colonist Martin Varner, sugarcane mogul Columbus Patton, and Texas Gov. James S. Hogg.